Hiei Zan or Mt Hiei, the sacred mountain known as the mother of Japanese Buddhism, has emitted the light of Dharma for the world for over 1200 years. Here it is also beleived that Mikao Usui studied Tendai teachings as a lay monk. In December 1994, Enryakuji on Hiei Zan was registered bv UNESCO as a World Cultural Asset. Since being built as a monastery by Saicho Dengyo Daishi in the 8th century, this sacred mountain has produced many of the most important priests in Japanese history. As the birthplace of a great human culture it has sent out a brilliant light for over twelve hundred years. There is no particular temple building named ‘Enryakuji’ on Hiei Zan. Rather the mountain as a whole is a temple called ‘Enryakuji’. Nature, the temple complexes scattered around the mountain, those doing ascetic practises, the visitors, all together compose the Buddhist community at Hiei Zan. As Buddha taught that everything on earth has buddha nature, here, religion, the natural environment, culture, and human beings are all integrated into an indivisible unity.Ancient people admired the mountain and composed poems about it, calling it ‘Mt. Fuji of Kyoto’.Embraced by an old forest, Hiei Zan has continued as of old to impress visitors. Though there are innumerable mountains in the world, Hiei is truly worthy of the name. This is the mausoleum of the founder, St. Saicho Dengyo Daishi and said to be the purest sanctuary on the mountain. Dengyo Daishi died in 822 and was buried here. The priests living in Jodo-in are called “Jishin,” after the Jishin who made a vow to retreat in the mountain for twelve years as a service to Dengyo Daishi. Their lives as monastics are dedicated to spiritual practices involving the strict keeping of precepts. Representing the esoteric teachings of the Tendai School, Hokke Soji-in was planned by the founder and built by his disciple St. Ennin Jikaku Daishi, in 862. Oda Nobunaga burned down the original building, which was rebuilt in 1987, 400 years after the attack. This temple complex includes the To-do, Kanjo-do and Jakko-do. Ninai-do is made up of two identical Buddhist practice halls, the Lotus (Hokke) and Constant Practice (Jogyo) Halls, connected by a covered passageway. It is popularly called Benkei’s Shoulders Hall, after a 1211, century monk-warrior, because of its shape. It symbolizes a basic teaching of Mt. Hiei that the essences of Lotus Sutra and Pure Land teachings are united. 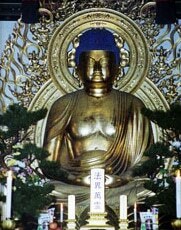 The Hokke-do is used for meditation and reciting the Lotus Sutra, while the Jogyo-do is for reciting the Amida Sutra. This temple is at the far north end of Yokawa, called Kabo (Fragrant) Valley. St. Nichiren lived here for twelve vears studying and practicing Buddhism. The Amida-Do is one of the newest temples on the mountain, having been constructed in honor of the 1,150 year anniversary of the opening of Mt. Hiei. In the temple is housed 100 copies of the Lotus Sutra, 500,000 copies of the Heart Sutra and 1 million Nenbutsu admirations unto Amida Buddha. Originally built to mimic Hiean Era construction techniques, visitors remark that, imaginatively, these buildings invoke images of the Pure Land. It is interesting to note that Mikao Usui is buried in a Pure Land Temple and many of his teachings seemed to come from the Lotus Sutra. It is claimed by living students of Mikao Usui that to meditate in this Amida-Do temple gives you further insights into the system of Reiki. 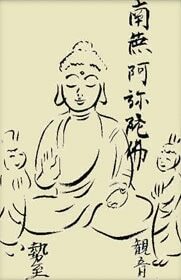 Tendai Buddhism practised on Mt Hiei had a deep and profound influence on later Japanese Buddhism. Dogen who later founded Japanese Zen Buddhism, Nichiren, Honene who founded Pure Land and Shinran who founded the popular Jodo Shinshu were all trained on Mt Hiei. an excerpt from ‘Tantric Art and Meditation’ by Michael Sasso.